Still Sealed Copy Of The Rarest Elvis Album In The World. This rarest of the rare historic and legendary collectors item came directly from Colonel Tom Parker and is in mint condition. All stickers including the Chicken Of The Sea are perfect as are the corners, spine, front and back cover. This is written in stone!!! Paul Lichter's Elvis Unique Record Club was founded in 1970 and has been supplying Elvis fans worldwide for four decades. Elvis Unique Record Club 10933 East Elmwood Street Mesa, AZ 85207. 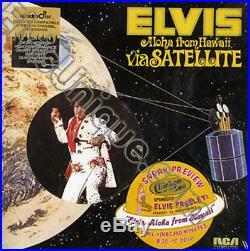 The item "Elvis Presley Aloha From Hawaii (Chicken Of The Sea) U.
LP" is in sale since Monday, September 10, 2018. This item is in the category "Music\Records".com" and is located in Mesa, Arizona. This item can be shipped worldwide.